International Track and Field 2 was released under five different names all in July or August 2000, much to my dismay because the specific one you're seeing here isn't even listed in Wikipedia, but thanks to Mobydick I now know this is the European PSX name and IT&F: Summer Games is the European N64 version name. Also not only are the names different, but the sporting events are also different depending on the version. Anyway this has gone off track, so before I'll foul here, let's do this proper. Ahem. 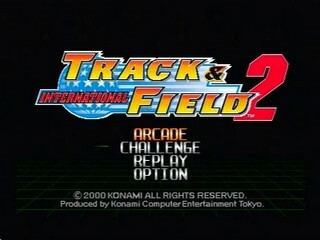 International Track and Field 2 was released in 2000 and continues the previous titles where players could complete against AI or each other to become the next world champion. Hey there! I'm Chris-X from Germany. Welcome to my International Track and Field 2 speedrun, completed on September 16, 2016. It's a single segment run on hard difficulty (that means you must have better results to qualify). The goal is to complete all events by beating the qualification time/distance/height/points and win the championship. The run was recorded with Elgato Game Capture HD. This run is approximately 1:02 minutes faster than my old run. The improvement is based on better tactics in Horse Vault, Springboard and Weightlifting and another order of sports. I did the sports in order of appearance to save time in the Arcade main menu. I only needed one valid attempt farther than 8.50 meters. The other two attempts are intentional fouls to save time. After running you have to push the jump button in the right moment to have enough tension. Then you have to hold this button until the bar is crossed. I only needed one valid attempt. Same tactic like Long Jump. The last two attempts are intentional fouls to save time. The two fouls were faster compared to my old run. I always chose the lowest possible weight to save time. In the first stage of an attempt you have to reach the OK sign by pushing the run buttons. Then you have to push the X-button while the OK sign is still glowing. In the second stage you must have the right timing to hit the OK sign. I managed to do that on the first attempt this time. In the last stage you have to keep the pace until the three light are on. In the last two attempts I hit the X-buttons as early as possible to cause a foul. This time I chose Back-Pike, Back-Tuck and Forward-Pike. All three are directly executed without stopping at the end of the board. Besides I didn't give a damn about the timing bar. This time I chose one 9.8 and one 9.4 jump because these are the first to appear in the menu. I use a piece of cloth to wipe over the buttons instead of pushing every single one. This is the most exhausting event because you have to keep the high pace for nearly one minute. This is the most annoying part of the run because you have to win at least one of the two races. Most of my attempts ended up here. You have to hit the run buttons in turn to strike the beginning of the blue bar with the arrow. The faster you move the harder it is to hit the blue bar. This is one of the events where you have to wait for your opponents. Their time is random.